Now, I don't think Joe was in business back at the time of the first photo, seeing as how the ground floor of this building was taken up by the Octagon nightclub. The sign wasn't even that fresh in 1990, though on something that seems to date from the 1950's, the custom phone number was distinctive, at least. 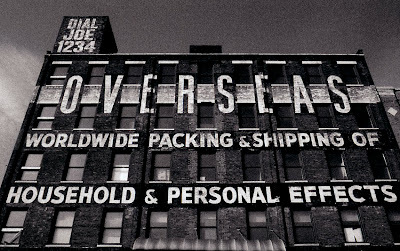 This warehouse is on west 33 Street near 11 Avenue, facing the West Side yards of the LIRR. Looking at it on Google Earth, it's an interesting building for the area, and probably the only holdout from the days of Hell's Kitchen being a busy waterfront business area. I say interesting, because hidden behind the six-story facade is a smaller, peaked roof. 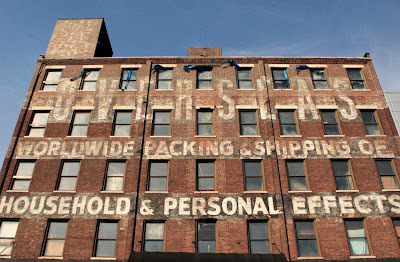 The windows on the far left side of each floor are for the elevator; the white bar across each is stenciled 'Shaftway'. The phone number (JOE 1234, barely visible today) is painted on the elevator's rooftop machinery room. I worked there, the Octagon Nightclub, from '87- "98. Sad, the owner was robbed of his building (eminent domain) for the 7 train extension station but the reality is the healthcare tower funding the train station allowed the eviction to take place. Building's history is very interesting. The current ground level is actually the second floor. The sidewalk was raised in the mid century to hide the train yard. At one point, it was a horse stable. Another great solidly built edifice-part of NYC history lost to greed.